Why do we fast at the Ember Days? "The fasting of the Quatretemps, called in English Ember days, the Pope Calixtus ordained them. And this fast is kept four times in the year, and for divers reasons. For the first time, which is in March, is hot and moist. The second, in summer, is hot and dry. The third, in harvest, is cold and dry. The fourth in winter is cold and moist. Then let us fast in March which is printemps for to repress the heat of the flesh boiling, and to quench luxury or to temper it. In summer we ought to fast to the end that we chastise the burning and ardour of avarice. In harvest for to repress the drought of pride, and in winter for to chastise the coldness of untruth and of malice. The eighth reason is of Master William of Auxerre. We fast, saith he, in these four times of the year to the end that we make amends for all that we have failed in all these four times, and they be done in three days each time, to the end that we satisfy in one day that which we have failed in a month; and that which is the fourth day, that is Wednesday, is the day in which our Lord was betrayed of Judas; and the Friday because our Lord was crucified; and the Saturday because he lay in the sepulchre, and the apostles were sore of heart and in great sorrow." "The Golden Legend or Lives of the Saints." Compiled by Jacobus de Voragine, Archbishop of Genoa, 1275. First Edition Published 1470. Englished by William Caxton 1483. In the Roman rite, Whit week is celebrated with great solemnity. The feast of Pentecost, or Whit Sunday, is preceded by a vigil, rather like the vigil of Easter. Not only is the Sunday itself a double to the first class, but so are the Monday and Tuesday, making it in effect a three day festival, with the Golden Sequence 'Veni sancte spiritus' said or sung at each mass. The Wednesday, Friday and Saturday are Ember days, where thanksgiving is offered for the first fruits of the harvest, and prayers are said for those who will receive minor or major orders on the Saturday. “In Rome, on the Appian Way, of St Tarsicius the Acolyte, whom the heathen found bearing the Sacrament of the Body of Christ, and asked what is was that he bore; but he deemed it an unworthy thing to cast pearls before swine, and was therefore assailed by them for a long time with sticks and stones, and gave up the ghost; and when his body was moved, the sacrilegious assailants could find nothing of Christ’s Sacrament in his hands or among his clothing; but the Christians gathered up the body of the martyr, and buried it with honour in the cemetery of Callistus.” Martyrologium Romanum, 15th August. 1. Full membership will be open to any Catholic boy or man who is able correctly and devoutly to serve low Mass in the traditional rite. Where applicants for membership are not known to the Secretary, a reference may be required to ensure that this condition is fulfilled. 2. Those not yet able to fulfil the requirement for full membership, but in training, may be admitted as probationary members. 3. Others who wish to may join as supporters. The Society is also seeking to invite experienced servers to become MCs of the Society. These will be the liturgical "experts" of the Sodality, charged with upholding standards, assisting with training of other servers, and countersigning applications for membership. If you would like to nominate anyone for an invitation to become an MC, or volunteer yourself, then please contact the Secretary. Although the Society has been inaugurated in England, members from other countries are equally welcome. There is no fee or subscription for membership, though donations will be gratefully accepted. On Saturday 15th May 2010, at Blackfriars, Oxford, a newly founded Sodality of Servers of the traditional Latin mass (“extraordinary form”) was inaugurated. This took place in the context of a training day for experienced altar servers, arranged by the Latin Mass Society of England and Wales, who were seeking to improve their understanding of the ceremonies of sung solemn mass. Thirty servers were present at the event, with the training being delivered by Fr Armand de Mallerey FSSP, Br Lawrence Lew OP, Mr David Forster, and Mr Richard Hawker. The new Sodality has been founded at the request of numerous servers of the traditional Mass, who desired a society that would encourage them in their work on the altar, provide training for both new servers and the more experienced, promote a high standard of reverent and exact service, and form a network through which servers can stay in touch and share resources. The Sodality is sponsored by the Latin Mass Society of England and Wales, though membership is open to those from other countries who may wish. 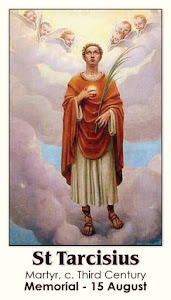 It has taken as its patron St Tarcisius, a Roman acolyte who was martyred during one of the fierce persecutions of the third century, while defending the Holy Eucharist from profanation. The Sodality has taken “Fidelis usque ad mortem” – Faithful even unto death – as its motto, and seeks to inculcate in servers an intense devotion and reverence to Our Lord in the Eucharist, as well as a precise attention to the ceremonies of Mass. A website for the Society has been inaugurated – www.saint-tarcisius.org.uk – where further details will be found. Anybody wishing to join the Sodality should contact the Secretary, Mr David Forster, at secretary@saint-tarcisius.org.uk.